San Francisco March 1940. "Built as the largest and safest office building in San Francisco, the Montgomery Block became the headquarters of professional men from 1853 to 1890. 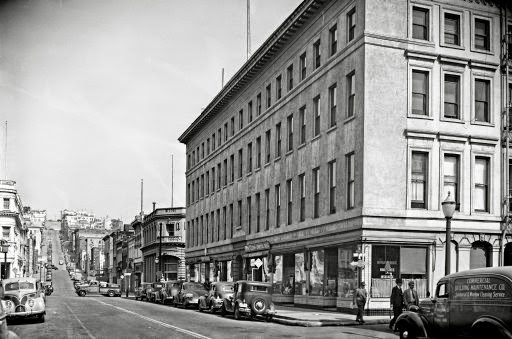 It was the only major downtown San Francisco building to escape the earthquake and fire of 1906." Previously seen here, its site became a parking lot in 1959, and is now part of the footprint of the Transamerica Pyramid. Large format negative by A.J. Whitlock for the Historic American Buildings Survey. View full size.